Game Streaming Central is a community of streamers that want to grow their audience. We grow by supporting each other. Whether you are brand new to streaming, or have been around since the Justin.tv days, all streamers are welcome to participate. There are several parts to our community. The community members themselves are the core of our community. Most of us have a presence either on Twitch and or on Beam. Those of us on Twitch appear on the front page of this website when we are Live. 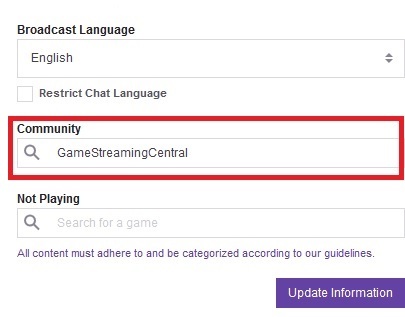 We also have a GameStreamingCentral Twitch Community that can be joined through your dashboard. Some of us have our channel on Beam. We are found on the Beam Team page. While this website is the central location of GSC, the hangout place is in our discord server. You are welcome to post a link to your stream in the main chat whenever you are Live. [Click Here] for an invite. We maintain a Twitter List that contains many members of the community. The “timeline” in the list only displays tweets from community members. You can subscribe to this list. It is also always shown in the right sidebar of this website. GSC also has an official Twitter page and YouTube page. On Twitter, our Director of Hype tweets about streams to watch. On YouTube, we have recordings of past community events such as Extra Life. If you are interested in participating more in our community, head over to the Join page.